Mom Would NEVER Let Me Do This At Home! to review one of their eco-friendly art kits, I couldn't wait. and they wanted people to be able to create art with family and friends. They sent us their "Art Dolls Kit"
and their "Collage Jewelry Kit"
and those in need of job training skills. They also sent us their "Art Journal Kit." so I was her assistant while "E" worked independently at the table with us. First, we all worked with the Collage Jewelry kit. gloss glaze, a paint brush, and an assortment of pretty tissue papers. The girls enjoyed this kit immensely. They each made a pendant style necklace. "E" (age 8) made this beautiful bracelet. "C"s bead, pendant, and felt fairy friend from the doll making kit. beautiful handmade papers they included in the kit. 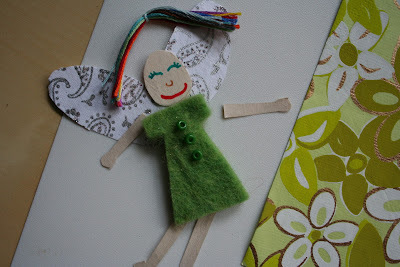 "E"s fairy doll in progress. It was so nice for the girls to work with such nice art materials. Want a chance to create and explore with an Artterro art kit with your own children? telling me which kit is your favorite. and close comments on January 17th at 9pm EST. The selected reader will receive the Artterro kit of their choice. Open to US residents only. Please make sure I can reach you by email. My family and I received three craft kits from the Artterro company for the purpose of this review. All opinions expressed are my own. I did not receive any additional compensation for this post. * Just Hanging Around Fun Photo Bookmarks! Click here to follow my blog and receive new posts by email. use the services and resources provided on our Site. © 2008-2014 Pink and Green Mama LLC. All Rights Reserved. Powered by Blogger.